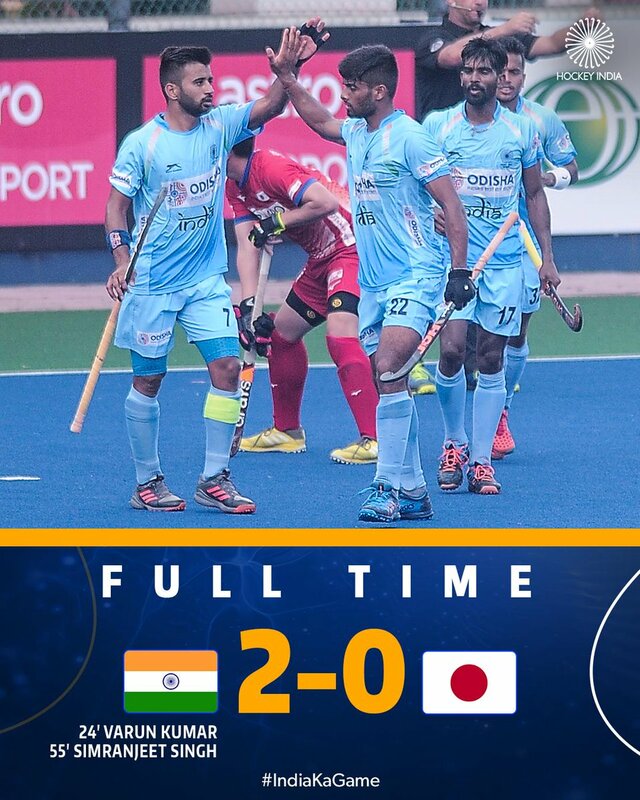 Scoring a goal in each half, Indian downed Asian Games champion Japan 2-0 in their opening match of the 28th Sultan Azlan Shah Cup Hockey here on Saturday afternoon. Varun Kumar gave India lead in the 24th minute when he scored off a penalty and Simranjeet Singh sealed the match scoring the second goal in the 55th minute. India started the match on aggressive note but the Japanese defence stood firm and foiled all the attacks. However in the 23rd minute India managed to earn a penalty corner. Varun Kumar with a powerful, direct flick found the target to put India ahead1-0. The midfield with tactical play by Manpreet Singh and Kothajit Singh enabled the forwards to make repeated forays into the rival’s striking circle. However, the strikers couldn’t find the right connection, missing field-goal opportunity by inches. With four minutes remaining for the half time, a good pass by Sumit Kumar (Jr) to Mandeep Singh who flicked it towards the post missed the net by a margin. The third quarter saw Japan make amends to a below-par start as they won their first PC in the 33rd minute. But goalkeeper PR Sreejesh did well to save and clear the ball ensuring India remained in the lead. The following minutes saw both India and Japan create scoring opportunities but in vain. In the 43rd minute, Japanese striker Kenji Kitazato took a brave shot on goal but missed the post by a big margin. Off a rebound, Kazuma Murata struck the ball towards the post but it went over it. Playing in overcast conditions with temperature at about 28 degrees, India powered by good fitness levels accelerated towards a strong finish. They hunted for a second goal with good precision and structured game play, the attack remained resilient as they created a penalty corner within minutes of the fourth quarter. Birendra Lakra was quick to respond and make a good steal. As timed ticked away Japan made desperate attempts for an opening but India defenders stayed cautious. Japan removed their goalkeeper to add an extra man in the 55th minute but the tactic backfired with India making use of the opportunity as their fine attack led to a second goal. It was a diving effort by Simranjeet Singh that put India ahead by 2-0. With just two minutes remaining, Japan created a penalty corner but the attempt was well-defended by Surender Kumar backed by goalkeeper Krishan Pathak who replaced Sreejesh after half-time. Varun Kumar was adjudged the Man of the Match as India registered a winning start to the tournament.